Scanning the programme for the May 1974 concert now reissued on BBC Legends seasoned Stokowski collectors may well be noting the existence of BBCRD9107. Back in 1995 the Radio Classics imprint released the concert – minus the 1964 Nováček – wholesale. It’s a funny thing but what then seemed reasonable enough sound quality now turns out to have been more than somewhat less so. Running the old BBC transfer alongside the new one effected by Paschal Byrne of the Audio Archiving Company has been an instructive experience and is one of the reasons that I would encourage those of you who still possess the Radio Classics disc to try this new one. Whether you will want to fork out for the privilege is a question only you can answer but I have to say that this performance of the Brahms Fourth seems to me to be the most exciting, galvanizing and convincing of all Stokowski’s efforts. If that tips the balance, well and good. Now for those transfers. The gains in detail and transparency are significant. What was murky and frankly turgid has now become lighter and clearer; there’s far greater depth all round and the string choirs are separated with maximal clarity. You can hear the solo strings in the VW as one rather failed to do back in 1995. I don’t hear any edginess as a result of the 20 bit digital remastering and nor do I find the newly scrubbed tapes anything other than a marked advance. The VW is a performance of almost ethereal and slowly refined beauty. It doesn’t materially differ from the Library of Congress performance enshrined on Bridge 9074 given with the Symphony of the Air, but the vast Royal Albert Hall makes a huge contrast to the LC’s boxier acoustic. The resultant tonal qualities are very different. The 1975 EMI recording with the RPO was perhaps less impressive. As a matter of fact I find Stokowski’s performance of his fellow student’s work far too languid and voluptuous but taken on its own terms one could hardly imagine it being done better. The Brahms is a remarkable example of Stokowski’s employment of fluid tempi. 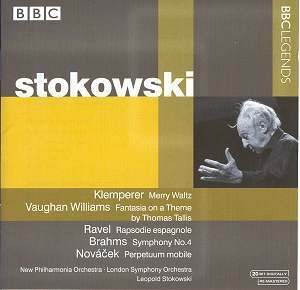 Sometimes the New Philharmonia is marginally caught out by some of the more abrupt transitions but by and large they follow Stokowski well. One of the features of his last years was the determination to press tempi; sometimes he was goaded either by friends or family and the result could border on the manic. There are indeed moments when the phrasing borders on the breathless. But turn back to the 1931 recording now on Music & Arts and we find that the slow movement has actually broadened in the Albert Hall and it’s only the finale that is measurably and appreciably quicker. I prefer this 1974 reading to that 1931 and also to the 1933; both have been widely admired however. His 1941 performance is also on Music & Arts, whilst another 1941 traversal has survived; the 1974 RCA/BMG recording does sound relatively static when measured against the adrenalin fuelled dynamism of the live concert and I can’t really recommend it. As I say this live one is the Stokowski Fourth I’d take with me – yes and that includes the accelerandi, wonderfully full-on horn sound, the inter-movement applause, the cracked horn in the slow movement, the audience splutters and coughs, the vibrant percussion detail and all. If you want dynamism, here’s dynamism. The Ravel exists in several versions – the 1934 Philadelphia, 1957 LSO on EMI, and a couple of live performances from 1959. Here despite the improved restoration work I’d opt for the Philadelphia. Not that the NPO’s performance is poor – it’s still a splendid example of control and phantasmagorical indulgence with Feria being the most gorgeous, exciting and pulsating example of all. Otto Klemperer had died about ten months before the concert and his old orchestra plays the not-really-so-brittle 1915 Waltz from his opera Das Ziel with real affection. At last one can hear details of the solo violin line that were pretty much obscured in the older transfer. And to end there’s the 1964 LSO Nováček in Stokowski’s ebulliently naughty 1940 transcription. I think you can more-than-infer by now that the advances in restoration work mean that this is a very viable purchase even if you already have that older BBC disc. I’d buy it for Brahms Four on its own.